Power, money, and religion can be a deadly mix as Mark Recusanto quickly discovers. Mark, the conference coordinator for a prominent religious mission society stands next in line to become the director when he is dealt a losing hand by sly and conniving Roger Cromwell, the founder. But at a winter religious retreat on a sunny Caribbean island, Mark uncovers shady deals and abusive acts of power that soon turn to death and treachery. 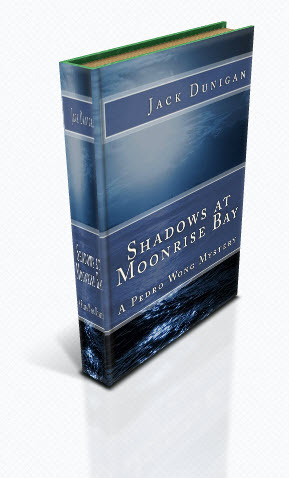 In steps detective Pedro Wong, whose cunning and skill leads him to discover secrets thought long hidden in the shadowy folds of religious institutional politics and in the faded light of years gone by. Shadows at Moonrise Bay is a tale of a man’s exploitation of power and his desperate acts to hide the secrets that could destroy him and all he has built. When they come to light, the shadows from which they emerge have hidden a wide and surprising circle of accomplices. Shadows at Moonrise Bay uncovers the means a polished religious professional uses to convince his followers he is something he is not and how someone had finally had enough.